How can you make sure you are at the top of the pile when it comes to making sure you get work quickly at the start of a new term? Here are our top tips. Make sure you have everything up to date. Keep us up to date with your latest details – it will help us to find you work more quickly. CV – Make sure you have sent an up to date CV to your consultant. If you need help to improve/enhance your CV, you could check out our article on writing a good CV. Referees – One of the key things which prevents us from offering assignments to our contractors is out of date paperwork, and in particular – references! So, make sure that you have these completely up to date by putting a call into your consultant and checking whether any more recent ones are needed. Availability – Does your consultant know which days of the week you are available? Axcis contractors can update their availability by using our simple online diary– make sure yours has been filled in for the new term! Apply for jobs – at Axcis, all of our jobs are advertised on our website. By applying, your consultant will receive a notification, and you will proceed directly to the shortlisted candidates who are being considered for the role. So get onto our jobs page today and start to apply for positions which appeal to you. Follow up with a call – once you’ve applied online for jobs, if there are any for which you feel you are particularly suitable, follow it up with a phone call. There could have been lots of applications for the position, and you’ll want to make sure you stand out. So give the consultant mentioned on the job advert a ring and talk to them about the role and why you feel you are suitable. They may give you advice to tweak your CV or do other things which will help you to secure it, so it’s well worth the time spent picking up the phone. Encourage your consultant to market your details – agencies will sometimes contact suitable schools on your behalf to let them know you are available for work. If you’d be keen for this to happen, it may be worth talking to your consultant and making sure they know how far you’d travel and what sort of schools you are keen on so that they can approach them on your behalf to seek out upcoming vacancies. Why isn’t there much day to day cover at the start of term? and day-to-day supply cover start to pick up. If you are seeking this sort of work, you might therefore need to be patient for the first few weeks of term, or more flexible than usual on what assignments you will accept in order to keep work coming in. Refer a friend for some extra cash! If you could do with some extra cash (and let’s face it – who couldn’t?) then it might be worth wracking your brains to see if you have any friends, colleagues or family who would be suitable for special needs teaching or support work – we offer up to £250 in vouchers for a successful referral*, so get your thinking cap on! *Terms apply – contact your consultant for details. Need SEND work or staff in the South West? 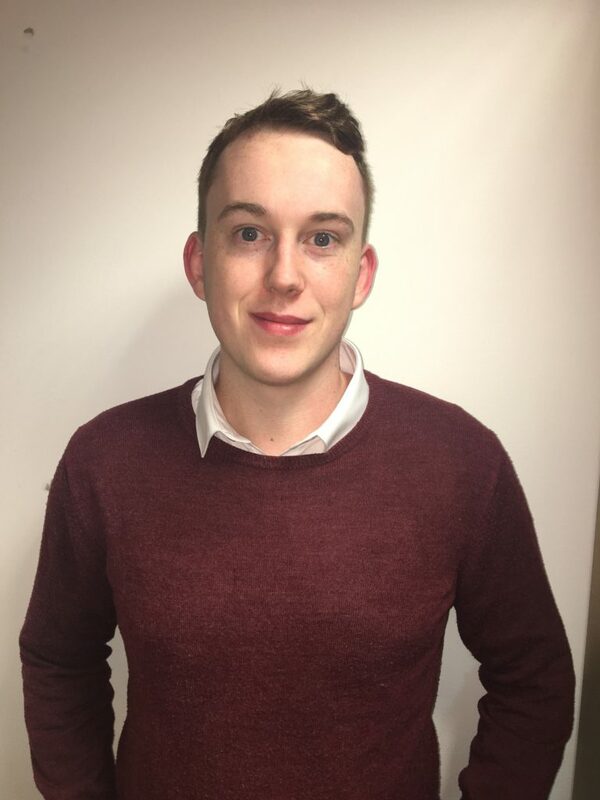 Our latest hires can help! Are you looking for assistance to find a new SEND job in the Bristol or South West England area? Or perhaps you need to recruit SEND staff for your school or provision? 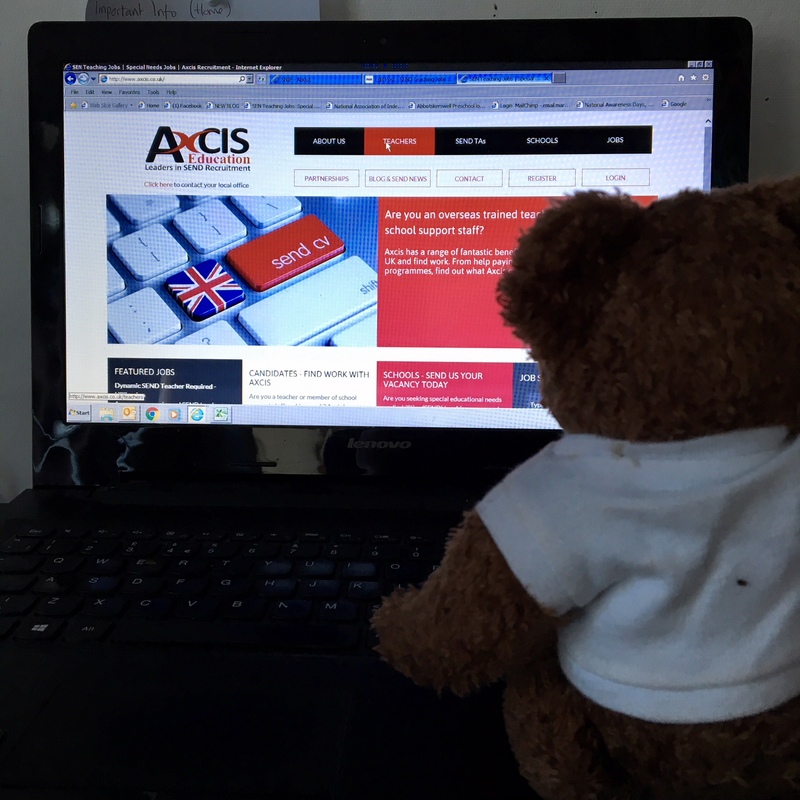 If so, then our recent additions to the Axcis South West team can help! Find out more about Dan and Gemma here as well as how you can register to work with them and their lovely team here. I hold a Level 3 Certificate in Recruitment Practice and have worked in education recruitment since 2014, mainly in the primary sector. In addition to this, some of my family members have disabilities, and I have seen first-hand the positive impact that comes with finding well-trained and appropriately suited support staff to work with them on a regular basis. It is this combination of personal and professional experience which drew me to working with Axcis Education Recruitment. I am passionate about finding the right candidates who can make a similar impact on the children we ultimately support with the work we do. I believe that the key to doing this successfully is through understanding the needs of the provisions I work with, and this is done by visiting schools, discussing needs in detail and taking the time to listen carefully to both my candidates and clients alike. I have been working in education recruitment since 2018, and am passionate about the importance of matching excellent teaching and support staff to the schools and provisions with which I work. I hold a TEFL (Teaching English as a Foreign Language) qualification and have spent six months in France, where I taught English at a school for children with disabilities. During this time, I experienced how rewarding working with special needs can be, and I saw what a difference that the “right” teacher can make and how they can have a positive impact the students they work with. This was, in part what attracted me to apply for a role with Axcis Education. I now work with both mainstream and specialist schools across the South West, helping them to find special needs teaching and support staff who can bring compassion, diligence and positivity to the provisions in which I place them. When I’m not at work, I enjoy reading, helping animal charities, spending time with family and friends and travelling. Are you seeking SEND work or staff? If you are seeking work (or staff) in South West England, then get in touch with Dan or Gemma today to see how they can help. Or if you’re seeking work in any other area, register online and we will put you in touch with your personal consultant in your local office. If you are thinking about working in a special educational needs and disabilities (SEND) school, or have just accepted your first post in one and want some tips to help you get started, then look no further. Before you undertake a role in a special school, you should ensure that you understand the needs of the students you will be working with. In some ways, this is no different to working in a mainstream school, as you should always seek out this information in order to pitch your lessons or support activities appropriately. However, in a SEND school this information may be more detailed, and there may be higher risks associated with not taking the time to seek it out and use it in your planning. For example, you may have children who have specific “triggers” you need to be aware of. I once spoke with a teacher who used a whistle in his PE lessons and had not understood that one of his students reacted very badly to high pitched noises… needless to say that this didn’t end well! By speaking to the SENCO and the existing teachers/support staff, you can make sure that you identify the specific needs of the students you work with and cater for them appropriately. I’m not suggesting that you go back to university and re-train as a SEND practitioner. However, if you are going to work in a specialist autism provision (for example), then it’s important that you understand the condition. This could be done via online courses (the National Autistic Society offer plenty!) Or simply by reading blogs, speaking with autistic people or watching things like Ted Talks. It’s really about broadening your understanding of the specific needs you’ll be working with and the sort of support strategies that can help rather than becoming an all-out specialist in any particular condition. Of course, there are a broad range of scenarios which could occur in schools and you can’t possibly cover every single one during training, but by preparing yourself for the most commonly seen and serious ones, you can start your new job safe in the knowledge that you are well prepared for it. This can be one of the trickier obstacles for a teacher or member of school support staff to negotiate when moving into a SEND provision for the first time. It may take a little while to fine-tune your activities so that they not only meet the cognitive needs of the students you work with, but also the personal needs. Your students will always get the most out of the sessions you prepare if you can provide them not just with materials which are suitably challenging, but also those which are suitably interesting to them. It is often worth speaking to other school staff members, carers or family members to find out about ability levels and interests so that you can have confidence that what you are planning is suitable and will be enjoyed by the students you work with. Some SEND environments can bring with them plenty of challenges. There may be children in your class with life-shortening conditions or profound special needs which limit their ability to participate in many activities. It’s important that you don’t let this aspect of the job get you down, and you build in plenty of opportunities to have fun in the classroom with your students. After all, if you are having fun, this is sure to rub off on those around you! By Emily Marbaix, Axcis Education. Easter is a lovely time of the year – with the warm weather approaching, school holidays to look forward to and plenty of time with friends and family, what more could you wish for?! In this blog, we share some ideas for craft activities you could try in the classroom or at home to get the children in the mood for Easter! It’s a classic, tried and tested idea but one we simply have to include. 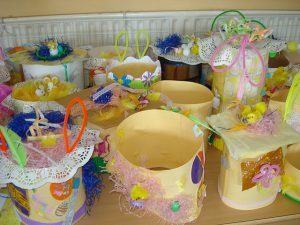 Easter wouldn’t be Easter without a Bonnet! Any craft materials you have! Decorate with ears, flowers and any other Easter/spring ideas you might have! 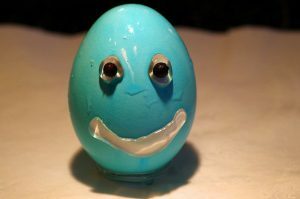 Another simple idea and a slight adaptation from standard egg-painting activities, you could ask your class to talk about how they are feeling and make some Eggy Faces to reflect this. A great opportunity for an emotions and communication exercise – especially useful for children with autism. 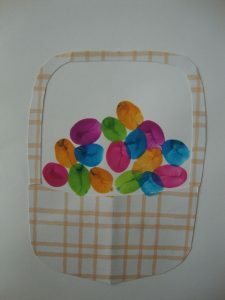 A craft activity you could do at any time of the year, but one you could also theme specifically for Easter. Try making chick or bunny sock puppets with your class for a fun activity in the run up to Easter. 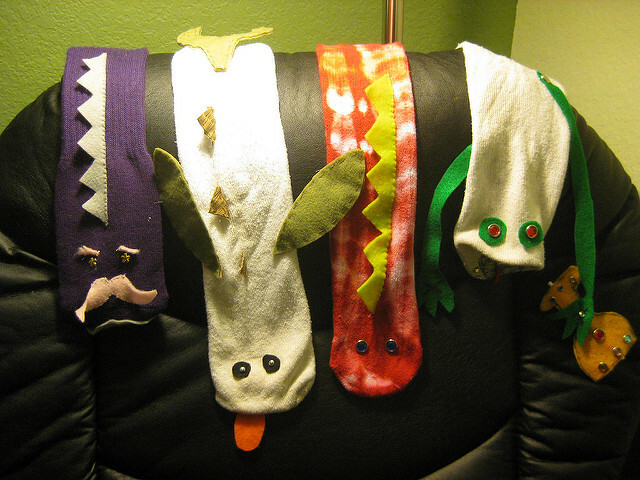 You could use your puppets to create a little play or to sing along to an Easter song! Make these lovely Easter Basket cards with your class – who doesn’t love a bit of finger painting?! Register with Axcis and become connected to a range of specialist and mainstream schools in your area for work. Are you seeking work with SEND children? Axcis can help! If you’re not already registered with Axcis, but would like to seek a SEND teaching or support position, why not get in touch or register today and find out how we can assist you? We have offices nationwide and a team of expert consultants who have proven relationships with specialist and mainstream schools in your area. Here at Axcis Education Recruitment, we are proud to support the National Autistic Society. As part of this, we have been actively involved in World Autism Awareness Week 2019. Not only have we sponsored the Schools Pack being offered by our partners, we’ve also been running activities all week in our offices across England and Wales. Find out more here. Axcis has been in partnership with the National Autistic Society since 2011. Since the start of this relationship we have worked together on a range of initiatives, from developing free online webinars about autism, to live Twitter chats with top autism researchers and professionals as well as many training events, seminars, and conferences. Axcis also sponsors Network Autism, the National Autistic Society’s vital online service created to bring autism professionals together across more than 12 professional sectors and from 90 countries. 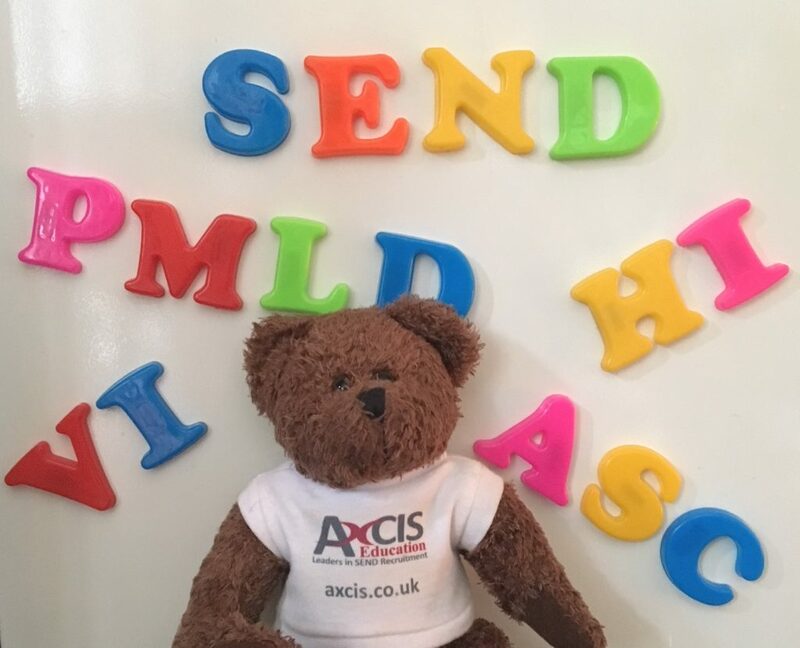 In 2015 the National Autistic Society also launched their “MyWorld” campaign – with the support of Axcis Education – to enhance autism awareness, training, and resources in schools. 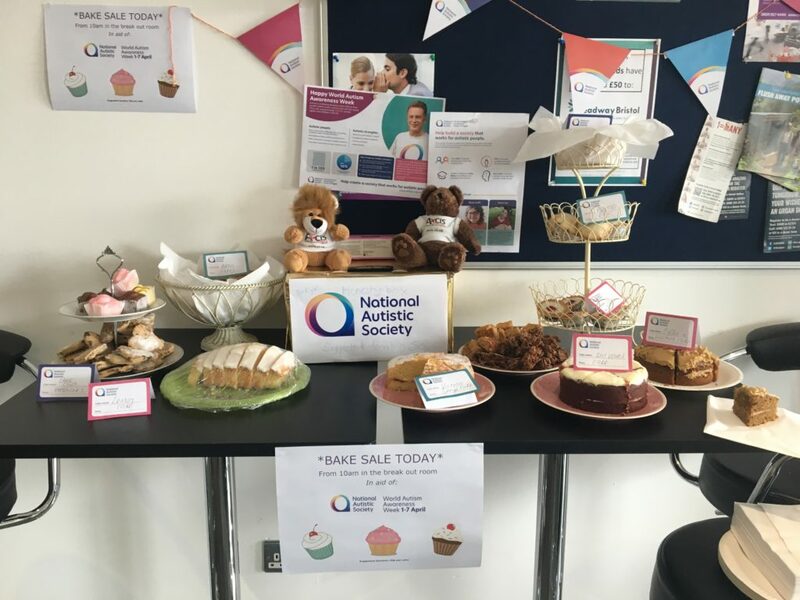 Pioneered by the National Autistic Society (NAS), World Autism Awareness Week aims to draw attention to the 700,000 people living with autism in the UK – both to educate those unaware of the condition, and to help make the world friendlier to those who are affected by it. 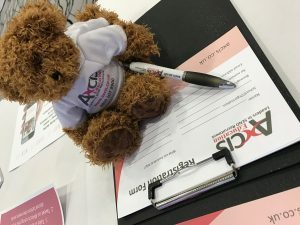 To help schools up and down the country get involved in World Autism Awareness Week, Axcis are proud to have sponsored the Schools Pack, provided free of charge by the National Autistic Society. In addition to this, we have also been running activities in our offices across England and Wales. 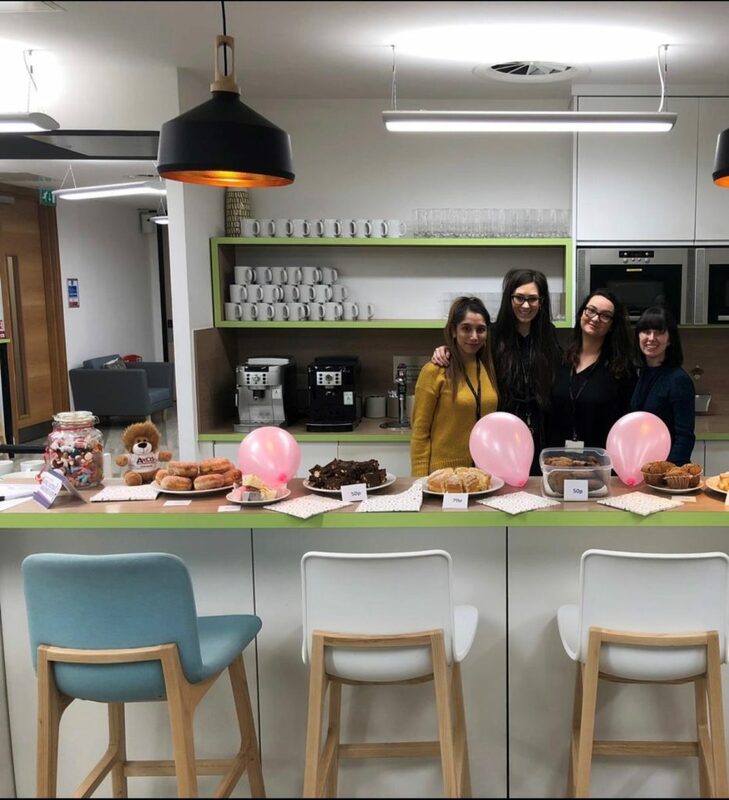 From bake sales to dress up days and quizzes, we’ve had lots of fun this week while raising money for our partners. 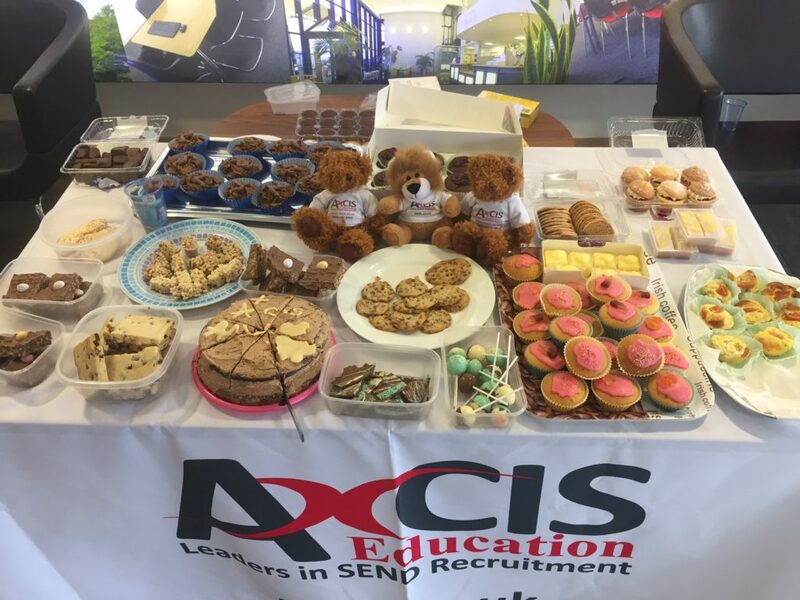 Our Midlands Team also hosted a Bake Sale which was a huge success! 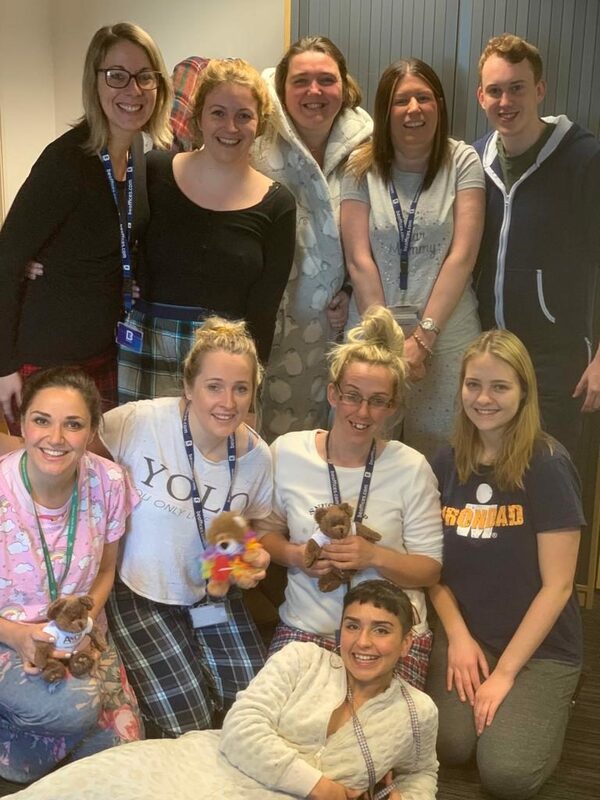 The Axcis South West and Wales Team had a PJ day! And we are still going! World Autism Awareness Week isn’t over yet and the activities in our offices are still going on. To stay up to date with our antics, or to see how much we’ve raised, keep an eye on our social media pages (links on the bottom right of this page). Are you looking for SEND staff or a SEND job? If you would be interested in a teaching or support position at a school or alternative provision, why not get in touch or register with Axcis today and find out how we can assist you? Alternatively, if you are seeking staff for your school or provision, or would like to refer a friend to us, pop us and email – we’d be happy to help! In this guest blog, kindly provided by our partners at the National Autistic Society, we bring you ten things you need to know about ten years of the Autism Act, plus a reminder that there are just a few days left to take part in their survey about it. 1. What is the Autism Act? Autism Act was defining legislation when it passed in 2009. It was the result of two years of active campaigning by thousands of National Autistic Society supporters and the All Party Parliamentary Group on Autism. It is the only act dedicated to improving support and services for one disability. 2. What is the APPGA? The APPGA is a cross-party group of MPs and Members of the House of Lords who work together to push autism up the agenda in Parliament. 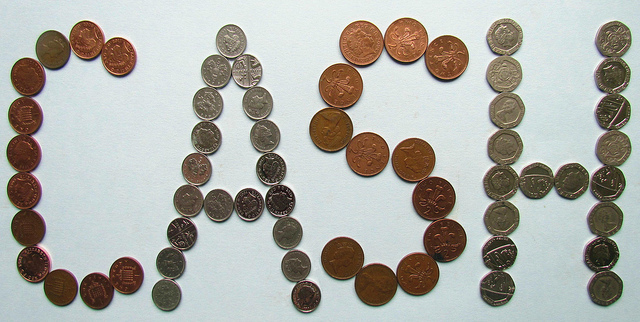 The National Autistic Society performs the role of secretary to the group. This year we are working with the All Party Parliamentary Group on Autism to review the implementation of the Autism Act. The first step of our project in recognising the 10 year anniversary of the Autism Act is to find out what has worked well, what hasn’t worked and what needs to change. As part of this we need your input – please complete our survey before 7 April. In 2009, prior to the Autism Act, most areas in England didn’t have an adult diagnosis service. Now almost all (93%) do. This has meant that more people have been able to receive an autism diagnosis. Because of the Autism Act, it is now essential that adults with autism and parents/carers are involved in the development of local services. The adult autism strategy recommends the setting up of local Autism Partnership Boards that “brings together different organisations, services and stakeholders locally and sets a clear direction for improved services”. 8. What does SAF mean? An Autism Self Assessment Framework (SAF) exercise must be carried out by all local authorities every two years. This shows the local authorities’ progress towards meeting the requirements of the Autism Act. The purpose of the self-assessment is to enable local strategy groups to review their progress and support future planning with partners including people with autism and their families. The 2018 SAF should be released shortly and we will use this data to compare local authority areas, develop benchmarks and identify areas where further action is needed. Ten years of the Autism Act is a big anniversary for us, so we are reviewing our progress so far and identifying clear areas which need to change. In October 2019, we will release a report which will detail our findings from across the year and recommend how the Government can improve the implementation of the Autism Act. We wouldn’t have got the Autism Act through Parliament without our supporters and we won’t be able to improve the strategy and statutory guidance without your help again. Please get involved with our work this year. Sign up to become a campaigner and stay tuned for our updates. Would you like to work with autistic children? April is Great Outdoors Month, and culminates with National Gardening Week (starting on the 30th). With this in mind, we are offering a fabulous Paper Potter and packets of butterfly attracting seeds in this month’s giveaway. Find out more about this great prize here, as well as how to enter completely free of charge. With reducing plastic waste so high on the agenda for many schools and organisations, how can you plant seeds and avoid using plastic plant pots? We have the perfect solution on offer as part of our April Giveaway. This Paper Potter turns old newspapers into eco-friendly, biodegradable seedling pots. This means that it’s a tool that can be used year after year, class after class. 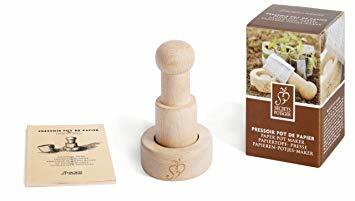 Whether you’re growing fruit, vegetables, sunflowers or any other kind of seed, this is a great little tool! 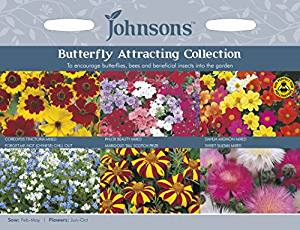 To get you started, we are including a variety of butterfly-attracting seeds to plant with your students. Once they get going, they could become part of the schools sensory garden, or they could go home to encourage more winged visitors. Our giveaways are always free to enter, no strings attached! We offer several entry methods so you can either take a quick peek at our Facebook page, Tweet us or sign up on our website for work and you’ll be in with a chance to win. Follow the link below and you’ll be sent to our third party giveaway page (run on there to keep things fair and square) – where you can choose your method of entry and get your name in the hat for this great prize! If you’re not already registered with Axcis, but would like to seek a SEND teaching or support position, why not get in touch or register with Axcis today and find out how we can assist you? Alternatively, if you are seeking SEND staff for your school or provision, or would like to refer a friend to us, pop us and email – we’d be happy to help! World Autism Awareness Week takes place from the 1st until the 7th April 2019. 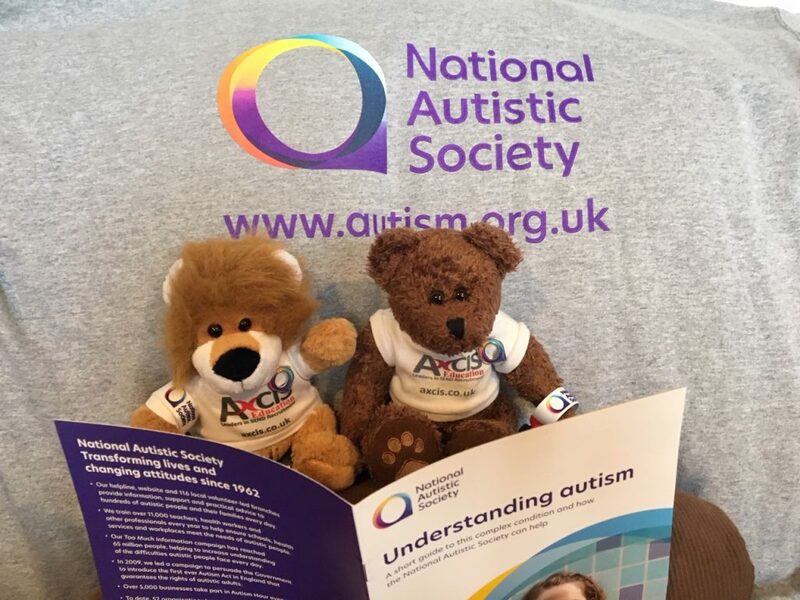 At Axcis, not only are we excited to take part, we are also enormously proud to sponsor the Schools Activity being offered by our partners at the National Autistic Society. In this guest post, we hear from Kate Vickers, Head of Supporter Fundraising for the charity. Kate, who has two autistic brothers, tells us why the week is so important to her. What does World Autism Awareness Week mean to you? An awful lot! My team launched the first ever World Autism Awareness Week in 2015 and I could not be prouder of all that we have achieved since then. 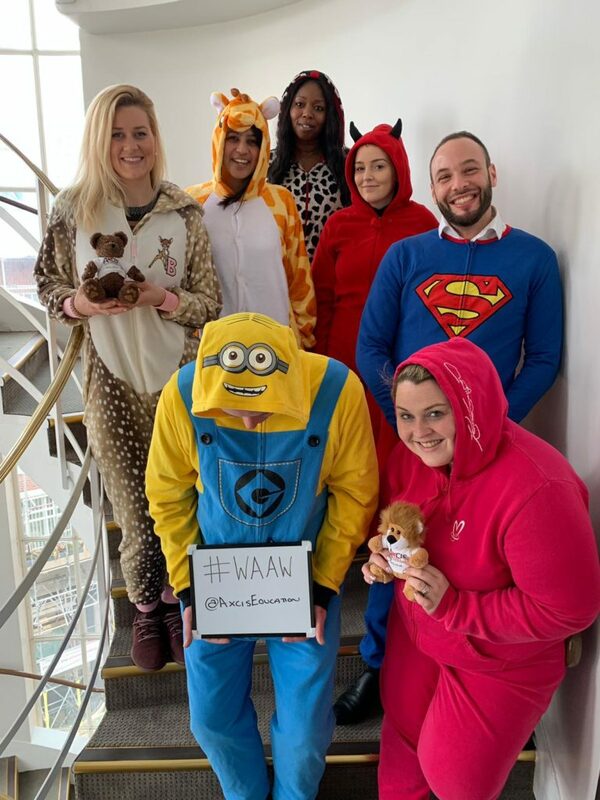 It has grown from a fundraising campaign based around ‘Onesie Wednesday’, raising around £100,000, to a global date in the diary, and now raises over £300,000 per year. Not only does that money go on to fund vital National Autistic Society work; World Autism Awareness Week is the peak time of year to unite our supporters and campaigners in getting our message and our cause out there. Most importantly, I am proud of what it means to autistic people and their families. It’s an opportunity for the National Autistic Society to not only raise funds for the cause, but also to bring everyone’s attention to the realities of autism: the challenges (which vary greatly in their nature and extent), the talents of autistic people and the happy moments that autistic individuals and families share with us. I get to meet a lot of our supporters and hear some amazing stories. Hands down, my favourite part of not just World Autism Awareness Week, but my whole job. What are you most looking forward to with this year’s World Autism Awareness Week? I’m really excited that the Spectrum Night Walks (our flagship World Autism Awareness Week event) will be taking place in Cardiff, Glasgow and Belfast (as well as Manchester and London) so we’re representing in all the nations this year! I’ll be in London again come 6 April, which I’m so looking forward to. The Spectrum Night Walks are just the most positive and lovely events to attend. You are surrounded by people who are so passionate about supporting us and raising awareness. Some of the outfits are incredible! And I love any excuse to go crazy with the glitter… as long as it’s in our brand colours! What is your proudest achievement with World Autism Awareness Week? This is not my achievement per se – World Autism Awareness Week is brought about each year through a whole team of people here at the National Autistic Society! – but I think I would say the work we do on World Autism Awareness Week in schools. We began to focus on schools during World Autism Awareness Week in 2016 and since then, we have made sure that that aspect of the campaign is prioritised and planned in detail. It makes me happy and proud to think that the teaching resources and fundraising activities that are adopted by thousands of schools have potentially supported so many autistic children. Not only that, but encouraging primary and secondary schools to teach their students more about autism could have an exponential effect when it comes to bettering levels of autism understanding and acceptance. I find that part of our work very exciting and gratifying. What should our supporters look out for if they want to get involved? Right now, I think information around World Autism Awareness Week is pretty hard to miss, for anyone who visits our website or follows us on social media. There are a few different ways of getting involved but I believe the most flexible and accessible way of supporting us would be to take on 7K for 700K. 7K for 700K is a virtual challenge that asks supporters to run, cycle, walk or swim 7 kilometres this World Autism Awareness Week in support of the 700,000 autistic people across the UK. Participants can take on the 7km all at once, or spread out the distance across the week. Or if you’re looking for a bigger challenge, why not up the ante and make it 17km, 70km or even 70,000 steps? There’s no fundraising target to hit – just a £12 registration fee. My favourite 7K-er would have to be the lovely Thomas Ivor, aged 9, who took on 7km of cycling, 7km of swimming and 7km of running all in one day to support us. Thomas is autistic and he is just the most amazing little guy. There are loads of other stories to check out on the website too – please have a read and if you’re feeling inspired… you know what to do! 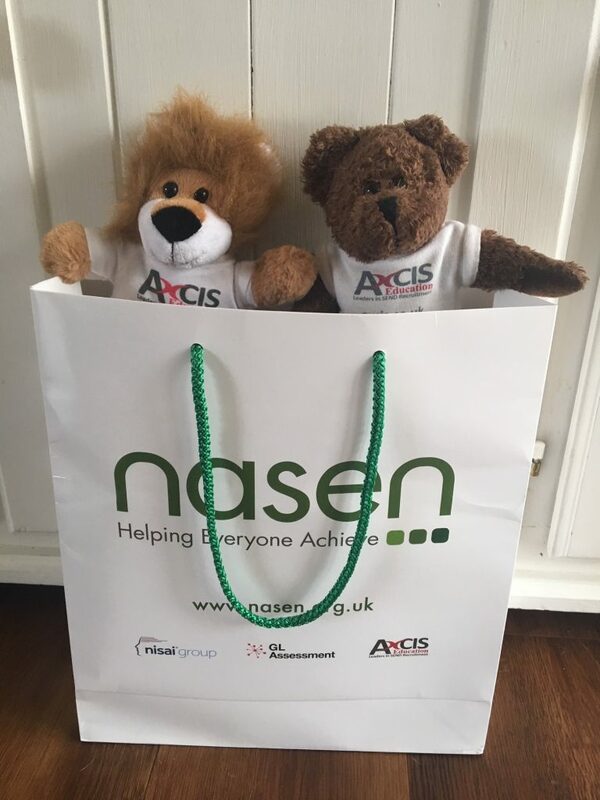 At Axcis, we are thrilled to be associated with the National Autistic Society and nasen. Each month, we bring you the latest news highlights from our partners, so if you’d like to know what’s been happening with these great organisations and in the world of SEND, read on. Below you’ll find a list of some of the latest autism news, compiled by our friends at Network Autism, the professional arm of the National Autistic Society. Each title is clickable and the link will take you to their website where you can find the full story. Below you’ll find a list of the latest SEND news from our friends at nasen. Each title is clickable and the link will take you to their website where you can find the full story. If you’re not already registered with Axcis, but would like to seek a special needs teaching or support position, why not get in touch or register today and find out how we can assist you? We have offices nationwide and a team of expert consultants who have proven relationships with specialist and mainstream schools in your area. Recently announced as the new patron for nasen, a charity we are thrilled to be associated with, Danielle Brown MBE has kindly provided us with this guest post. She talks about her journey from struggling at school with PE, through a difficult period of diagnosis for her disability and how she has overcome this to achieve sporting success. We think you’ll agree that this is an inspiring story. I have something called Complex Regional Pain Syndrome. It’s a neurological condition that causes chronic pain in both my feet all the time. Not the most pleasant of things, but it is what it is. Sport played an important role in my childhood. I grew up in a very active family and I loved nothing more than being outdoors. But at eleven years old my feet started to hurt after I’d been running. It progressively got worse until walking become unbearably difficult and taking part in all the sports I’d loved doing was impossible. It took me five years to get my diagnosis. CRPS was – and still is in some cases – difficult to diagnose and not always well understood by the medical professionals. Five years of medical appointments, scans, medication and physiotherapy. Some doctors tested me for brain tumours, others accused me of making it up. All in all, it was a very difficult time for me and it completely fractured my self-esteem. Growing up is a difficult time for anybody; it’s where we start to figure out who we are and what we want to do with the rest of our lives. The world places so much value on outward appearances and I… well, I was broken. I didn’t fit within that blanket ideal of physical perfection, which further singled me out. I was different, and different is sometimes a very lonely place to be. At school, PE had gone from being my favourite subject to becoming a living nightmare. My mum did her best to keep the school updated, but without a diagnosis it was very difficult to get teachers to understand. I was still expected to participate, which caused my pain levels to skyrocket. In the end my Mum ended up pulling me out of PE and I spent two hours a week sat in the school library. Sport ended up being the thing that turned my life around. I missed being active, missed being outdoors, so I looked around for a sport that didn’t involve lots of running or walking and figured that archery was something I could do. For my fifteenth birthday my Dad and I did a beginners course at a local club, and I was terrible! It was a miracle if I could hit the target, never mind the middle of it but it was so much fun. Every night I’d pester my parents to take me to practice, and the more I practiced the better I got, the better I got the more I enjoyed it and the more I wanted to practice. Three years later I made the Great Britain team. 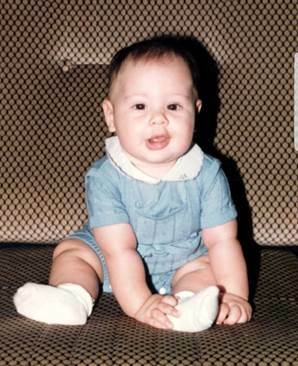 I jumped straight in as World Number 1 and hung on to that position for my entire career. I won gold in Beijing 2008 and retained my title on home soil in London 2012. I won five World Championship titles, held all twelve Paralympic World Records and did something that not very many disabled athletes manage – I made it onto the able-bodied team. In 2010 I proved to the world that disability does not have to be a barrier to success when I became the first disabled athlete to represent England at the Commonwealth Games, where I won a gold medal in the team event. Sport transformed my life, challenging the perceptions I held about myself. There was a time when my disability was the cause of many insecurities and fears, and coming to accept myself for who I was and see beyond my physical limitations was a rollercoaster of a journey. This does not mean that I pretend this part of me doesn’t exist. My disability plays a big role in my life. It’s a constant companion, and truth be told I cannot remember what it is like to live without it. It has shaped my life, it has closed doors and opened them and it has made me the person I am today. It has been the very worst thing that happened to me, and the very best. But I am not broken. There is nothing ‘wrong’ with me and my disability does not restrict me in any of the ways that matter – I have pushed the boundaries of my potential and redefined what I thought I was capable of. Looking back at my story, my teachers could have explored the different options available to me. They could have let me know more about inclusive sports and focused on my ability rather than my disability. Even though it worked out great for me in the end, I wonder how many other young people miss out because they aren’t given the right messages or support. And this is why I want to help others. We all have the capacity to make a difference. So many people helped me turn my vision of winning medals for Great Britain into a reality. The belief my coaches had in me, the creative ‘no barriers’ thinking from my team, the unending support my family and friends gave me, the kindness of volunteers. I wouldn’t be here now if it wasn’t for them. I now work with young people to help them unlock their potential and see their limitless potential. I equip young people with tools to help them raise aspirations, develop a success mindset and build confidence levels, whilst proactively supporting their mental wellbeing. We all have mental health, just as we all have physical health and if we proactively learn how to look after our mental wellbeing we are better placed to prevent issues from arising and live life to the best of our abilities. We can all achieve great things given the right support and encouragement. Disability does not have to be a barrier to success if we approach it in the right way, so never underestimate the power of your words. 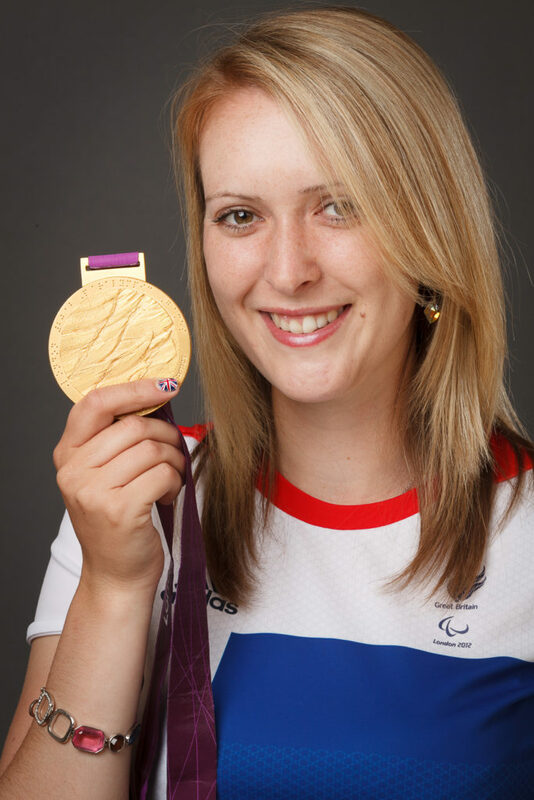 Danielle Brown MBE is a Professional Keynote Speaker, Training Provider and Coach. Her organisation inspires and empowers people to unlock their potential, overcome adversity and achieve big goals. Her online programme Your Journey To Success© centres around improving mental wellbeing and academic performance in schools and she has co-authored Be Your Best Self (coming September 2019), a self-development book for 7-11 year olds. If you think you have what it takes to inspire young people like Danielle and would be interested in a teaching or support position at a school or alternative provision, why not get in touch or register with Axcis today and find out how we can assist you? Alternatively, if you are seeking staff for your school or provision, or would like to refer a friend to us, pop us and email – we’d be happy to help!